I am joining the Back to the Classics Challenge 2019. 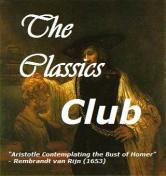 A new challenge for me, and I am hoping it will help keep me moving along on my Classics Club List. The challenge is hosted by Books and Chocolate and is in its 6th year. There are lots of rules and information at the signup post. 4. Classic in Translation. Any classic originally written in a language other than your native language. 5. Classic Comic Novel. Any comedy, satire, or humorous work. 7. Very Long Classic. Any classic single work 500 pages or longer, not including introductions or end notes. 9. Classic From the Americas (includes the Caribbean). Includes classic set in either continent or the Caribbean, or by an author originally from one of those countries. 10. Classic From Africa, Asia, or Oceania (includes Australia). Any classic set in one of those continents or islands, or by an author from these countries. Chinua Achebe – Things Fall Apart (Nigeria, 1958). 11. Classic From a Place You've Lived. Read locally! Any classic set in a city, county, state or country in which you've lived, or by a local author. Participants may read 6, 9 or 12 books from this list, so I may not read all of these. J. Robert Janes has written a series of sixteen books about two men in Occupied France in 1942 and 1943 who are on opposite sides but must work together. Gestapo officer Hermann Kohler and his partner, Sûreté Chief Inspector Jean-Louis St-Cyr have been instructed by their superiors to work together to investigate crimes. Over time, they develop a trusting relationship, but know that due to the realities of war, it will probably not end well. One side or the other will be the victor, and then where will their loyalties lie? Jean-Louis St-Cyr of the Sûreté Nationale has been teamed with Hermann Kohler, formerly a Munich cop, now of the Gestapo, with respect to all police investigations of the so-called "ordinary crimes." They are sent to Lyon to find an arsonist. A fire set in a cinema has left one hundred and eighty-three Frenchmen and women dead. Is the crime linked to prewar cases of arson in Lubeck, Cologne and Heidelberg in Germany? Or to the Resistance, several of whose members were trapped in the flames? Or is there a pyromaniac at large who kills for sexual thrills and release? St-Cyr and Kohler face their most difficult challenge as they take on the case of the firebug who has been given the name of Salamander. I am a fan of this series, but it has it problems. The writing is sometimes jerky and the story is often hard to follow. For me, the effort is worth it, primarily for the portrayal of France and it citizens during the German occupation. And the characterizations of the two policemen. In this book we are in either Kohler's head or St-Cyr's head much of the time. This provides many hints to their characters and details about their friendship but also contributes to the confusion with frequent changes of point of view. 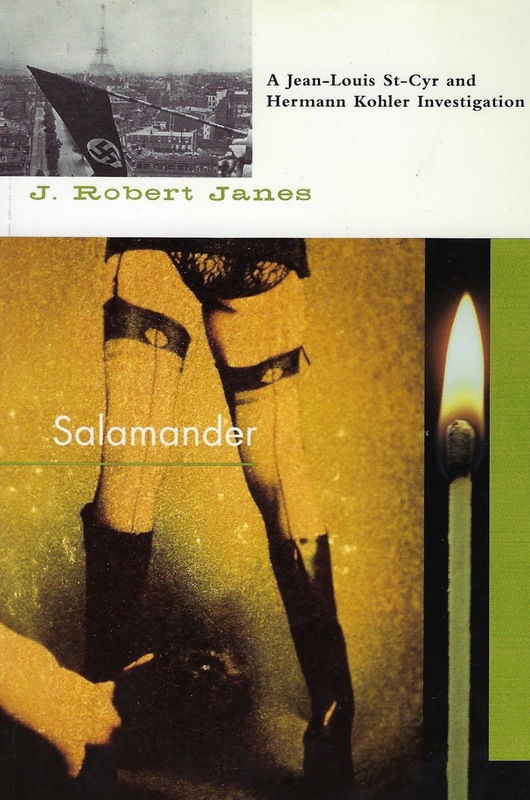 This particular book in the series is heavy on sexual content, with a brothel and sexual perversions being a major element in the investigation. 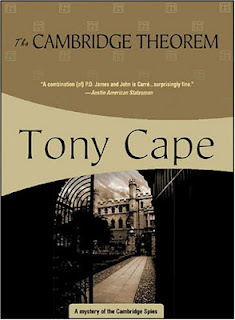 Each book ends with a reference to the next case. There is very little time between each book. It isn't like a cliffhanger, just an enticement, and it works with me, I want to jump into the next one immediately. Why did I read this book, now? Because the investigation is set around Christmas time, a time when everyone would rather be doing anything else but investigating an arson case. The fire occurred two days before Christmas and there are references to Christmas throughout. But this is not a cheery Christmas story. For anyone interested in the series, I would recommend starting with the first book in the series, Mayhem (also published as Mirage) which provides background on the major characters. Cara Black, author of the Aimee Leduc series, wrote a post on Mayhem, which also covers Mannequin, Sandman, and Stonekiller. J. Kingston Pierce posted two interviews with J. Robert Janes in 2012, one at Kirkus and a second at the Rap Sheet. I am not sure if I have read A Christmas Carol before, but it felt brand new to me as I read it a few days ago. I have, of course seen some adaptations of the story but the only one I remember is Scrooged with Bill Murray. It is one of my favorite Christmas films, but of course it is a departure from the original story. The novella has a very simple structure. In the first part, Scrooge is revealed to be a bitter man who has no sympathy for the poor and whose every thought is aimed at making more money. On Christmas Eve, he leaves his place of business at the end of the day, after being rude and inconsiderate to his employee, his nephew, and some people seeking donations for the poor. He goes home but immediately notices odd occurrences; the iron knocker on his door looks like the head of his old partner, Marley, now dead. Marley appears before him, in chains, and foretells that that three visitors will come and will try to save Scrooge from Marley's sad fate. In the middle three parts, the three ghosts visit Scrooge and take him on heartbreaking and scary tours of Christmas Past, Present, and Future. And Scrooge does experience an epiphany and becomes aware that he can change. The last part shows Scrooge's redemption and his new relationships with family and friends. Just about everything. I liked the way the story was told. The narration pulled me into the mood immediately. Not only is the book a pleasant and humorous read, while giving us a beautiful story of redemption and finding new happiness, it also shows us today what life was like in the 1800's, especially for the very poor. The edition that I read had wonderful illustrations by Roberto Innocenti. 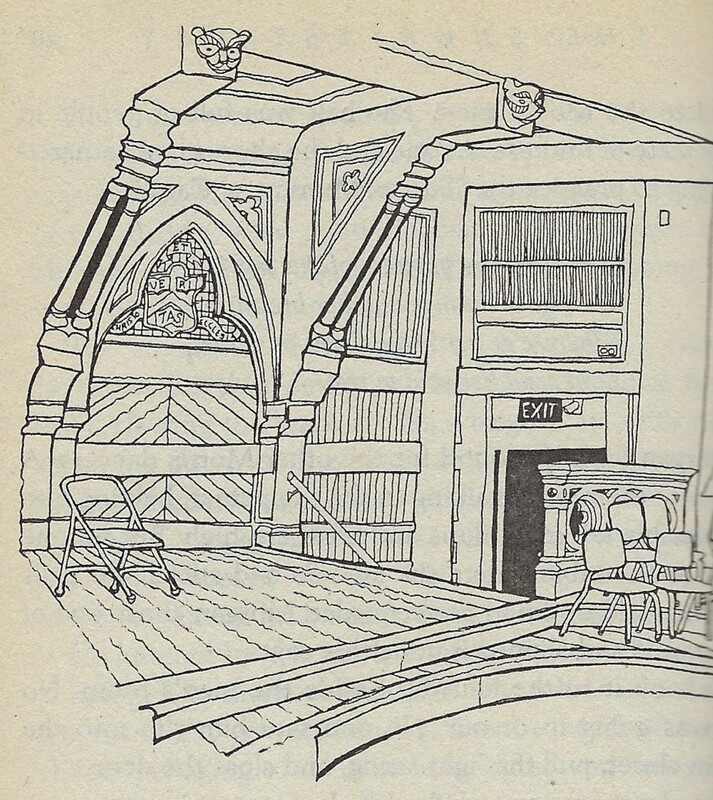 The illustrations enriched the reading experience. ...they stood in the city streets on Christmas morning, where (for the weather was severe) the people made a rough, but brisk and not unpleasant kind of music, in scraping the snow from the pavement in front of their dwellings, and from the tops of their houses, whence it was mad delight to the boys to see it come plumping down into the road below, and splitting into artificial little snow-storms. If I had to find some complaint about the book, I would point out that Scrooge reversed his attitudes awfully quickly. On the other hand, who wouldn't change if they were in the middle of being taking back and forth in time by ghosts. I sensed that deep down he was ready to make amends. And this is a fantasy / ghost story anyway. A parable of sorts. It is encouraging that this story has endured for so long. I understand now why some people read this every Christmas. It is a quick read, very entertaining, and joyful. Length: 152 pages, with illustrations. Source: From our collection of illustrated books. The Shortest Day is the 11th book in the Homer Kelly series. 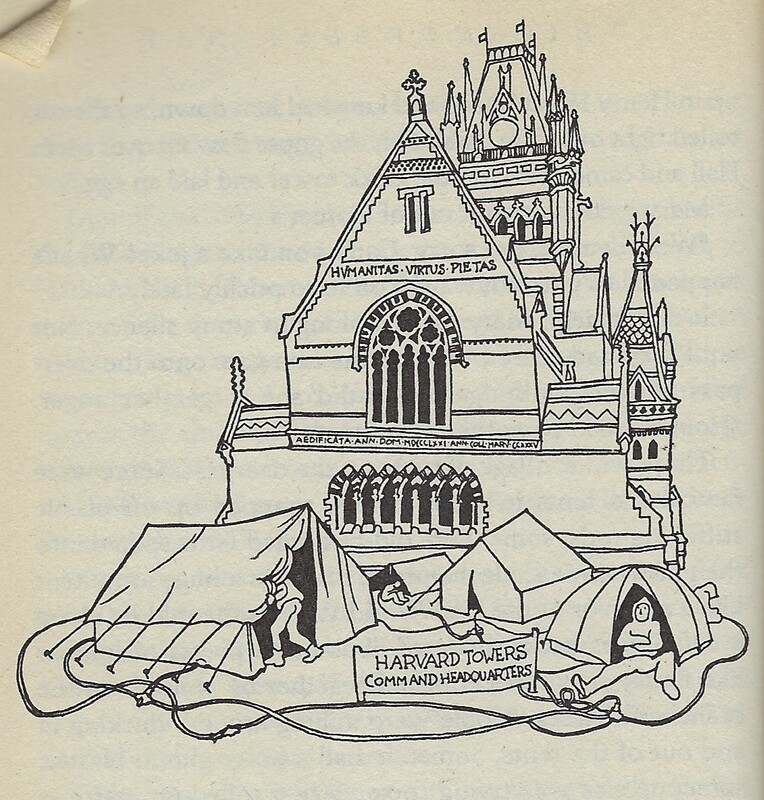 This story is set in Cambridge, Massachusetts, where Homer and Mary Kelly are teaching a class at Harvard University. Mary is participating in the annual Christmas Revels when a young singer in the event dies in an automobile accident. When other deaths follow, Homer resists getting involved, even though he was once a homicide detective. 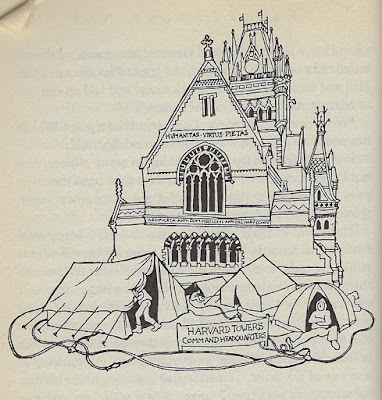 This book centers on the production of the Revels and an activist group seeking housing for the homeless; the author illustrated the story with her own pen and ink drawings. I have been featuring some books that are set in December around Christmas this month, but this is the first book that is truly seasonal, with the story built around the Christmas season and the Winter Solstice. Of course, it wasn't just the festival of Christmas they would be celebrating, it was also the winter solstice. Some of the Revels themes had nothing to do with the birth of Jesus. They were pagan stories, they were magic, they were ancient rites challenging the cold of winter in its darkest time, awakening the growth and greenness of the spring. And some were wassails praising the joys of good brown ale, and some were haunting entreaties to the wild deer in the forest, appeals by the hunters to the hunted to allow themselves to be killed. And always there was the stamping and leaping of the Morris dancers, which had no connection with the Christian nativity at all. In this mystery, which really doesn't involve much investigation, Homer Kelly takes a back seat to Mary, who notices what is going on and sees the clues. He, on the other hand, doesn't see any evidence of wrongdoing until much later in the story. This is, in essence, an inverted mystery, because the reader does know early on who is causing the deaths. I mention that because some mystery readers prefer stories where they can guess who the perpetrator is and why. 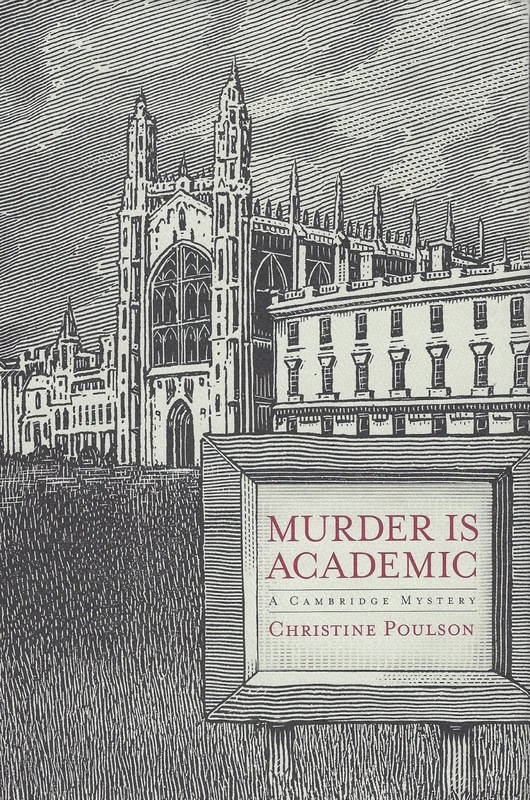 This is a quirky and humorous mystery in an academic setting. it is a nice cozy and mildly humorous mystery set at Christmas, with background on the Christmas solstice and accompany celebrations. 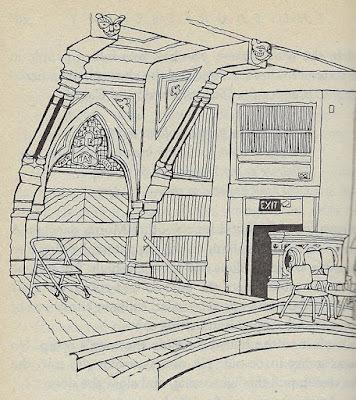 The line drawings are lovely and add to the story. There are interesting side stories about the homeless and urban poverty, and an astronomer who is photographing the analemma over a year's time and is nearly at the end of this project. Winner of the Bouchercon Lifetime Achievement Award, Jane Langton (b. 1922) is an acclaimed author of mystery novels and children’s literature. Born in Boston, Massachusetts, Langton took degrees in astronomy and art history before she began writing novels, and has set much of her fiction in the tight-knit world of New England academia. See also an article that appeared in Mystery Scene magazine in the Spring 2012 Issue #124. This book begins with a funeral. A very young boy that Smilla has befriended is dead as the result of a fall off a building. The death is almost immediately declared to be accidental, but Smilla disagrees. She files a complaint, and an investigator comes out, but the investigator is not convinced. Smilla will not give up, she is determined to find out who would kill Isaac and why. The story takes place mostly in Denmark. The last third takes place on a ship, the Kronos, on an expedition to an island off Greenland. Smilla was originally from Greenland, although her father was Danish. I learned a lot about the relationship between Greenland and Denmark. And the cold, cruel weather in both of those countries. 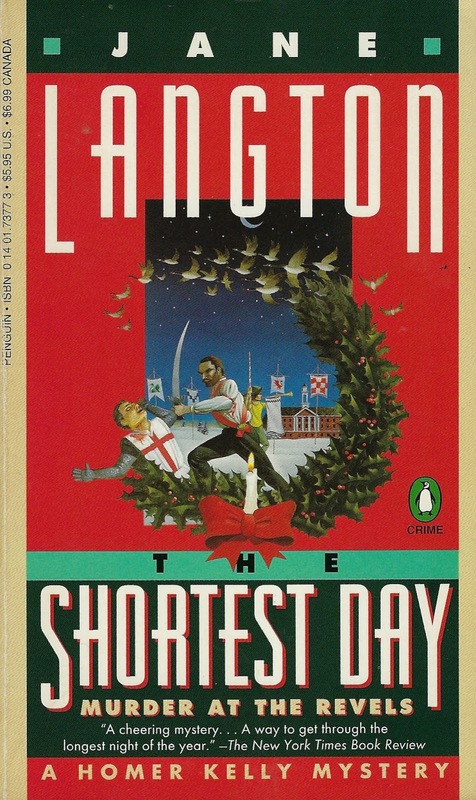 As you can see from the cover, the story takes place around Christmas and New Year's Day. Smilla is not fond of holidays, but her father tries to get her to celebrate with him. They have a difficult history and relationship. This was a reread (after about 25 years so I remembered nothing about the book), and I think I loved this story more the second time. The writing is just beautiful. It pulls you in. It took me longer than usual to read this book and that was partly because I wanted to extend the experience. The story is written in present tense, and usually I find that distracting. However, I have found that I notice it much less when the story is also told from the first person point of view, and that works well here. "Smilla," he whispers, "when I was a child I had a tank you could wind up – with caterpillar treads. If you put something down in front of it, it would climb straight over it because it had such low gears. If the object was perpendicular the tank would turn around and crawl along the edge until it found some other way over. You couldn't stop it. You're like that tank, Smilla." Smilla is also very intelligent with a scientific background. She is a strong female protagonist, with a mind of her own. I found her to be a very attractive character, and that was a major factor in my enjoyment of the book. Some people don't care for the ending, and I don't want to tell too much about it. I really wasn't bothered by any aspect of the ending because I knew the story could never end the way I wanted it to. 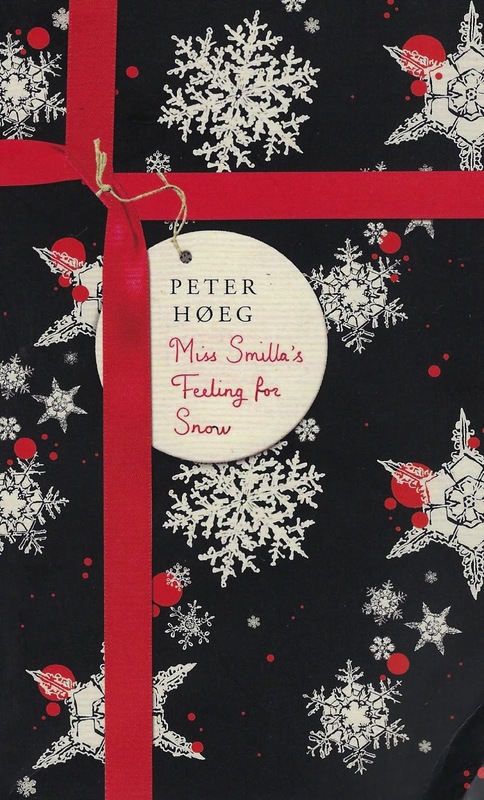 The original language of this book was Danish, and it has been translated into English in two different versions, one published in the US (with the title Smilla's Sense of Snow), one published in the UK. There are disagreements about which translation is best. I read the US version the first time, the UK version the second time. This was not intentional, I did not know about the two translations until after I purchased my copy. I found more information at A Crime is Afoot, and here, if you are interested. I read nine books in November. One book was a fantasy; one book was a nonfiction book about books and reading. The rest were crime fiction. I started three new (to me) series, and all of those were very good. I did make some progress on Les Miserables, which I am trying to finish by the end of the year. But I am still only about 2/3 done with that book (800 out of 1200 pages, approximately). I love reading. When I finish one book, I am always excited about picking my next read. I have to have a book with me to read, just in case... So I appreciate reading about other booklovers. Like any other book of essays, not every one of the topics appealed to me. But overall this was a great read that I will go back to from time to time. Suggested at Kay's Reading Life; see her post for more detail. Oh my goodness, I finally finished the last book in this series. It is a whopping 607 pages long. I am glad I read this book, I think it finished the series off very well. I just wish it had been shorter. The last 200 pages were great; the first 400 pages had too much padding. Victoria Jason Hime is a successful screen writer and novelist. Her most recent novel has been bought by a film studio and her husband, Albert Hime, is hoping to produce the film. Then, before he gets the chance, he dies of poison and Victoria is the primary suspect. I enjoyed the way the story was told, and the ending was very surprising. My thoughts are HERE. Entry Island blends historical fiction with a present-day police procedural. Both stories come together in the end, as we expect. I liked what I learned about both settings. The historical focus is on the Highland Clearances which take place on the Isle of Lewis and Harris. The current investigation centers on a death on a small Canadian island (Entry Island, which is a part of the Magdalen Islands). This was an unusual and compelling story. In this impressive, disturbing novel of psychological suspense, Luther Grandison is a famous director of stage plays and movies who holds sway over his two young female wards, one rich, one beautiful. His young secretary, Rosaleen, has recently committed suicide by hanging herself. Rosaleen's good friend Jane has taken the position of secretary to Grandison, as she suspects that the death was not suicide. 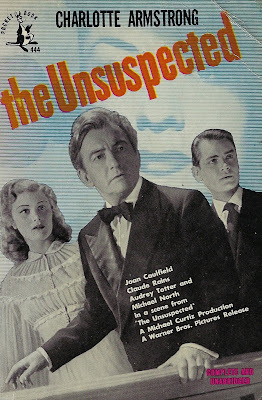 There is a film version starring Claude Rains as Grandison (which I have not yet seen). This is the first novel in the long running Cork O'Connor series, set in the small town of Aurora, Minnesota near Iron Lake and the Iron Lake Reservation. Cork, the former sheriff, is half Irish and half Anishinaabe. An influential local judge is found dead, an apparent suicide; Cork is the one who discovers the body. A young Indian boy is missing and his mother seeks Cork's help to find him. 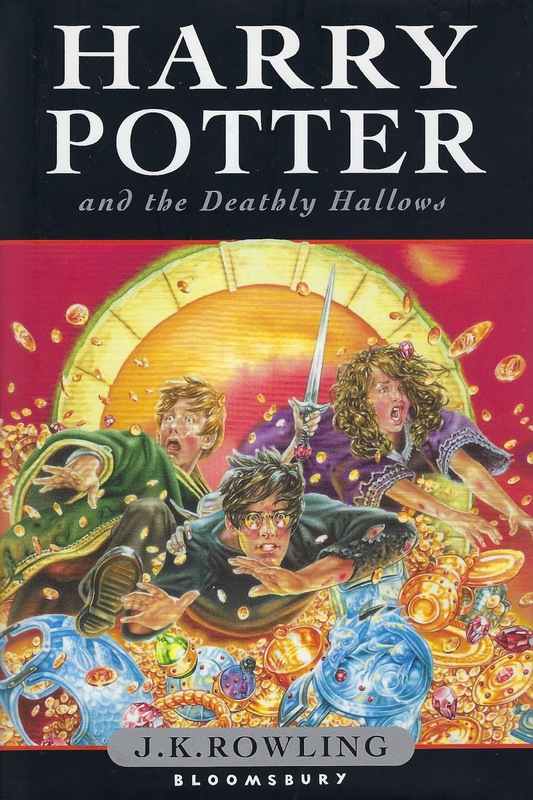 I loved this book and plan to read more of the series. My thoughts are HERE. This book is the 18th Jack Reacher novel (out of 23). It is the book that the latest Jack Reacher film is based on, which is why I read it now. This is only the third book in the series I have read and I loved it. The first installment in a wonderful new series (to me) that follows the exploits of Benoît Courrèges (Bruno for short), a policeman in a small French village. This seemed like a fantasy because the life in the village is (at least on the surface) so rustic. That description makes it sound on the cozy side, and it is not that at all. Although this book is heavy on the details of Bruno's past and the setting of the series, I am sure I am going to enjoy more of these books. 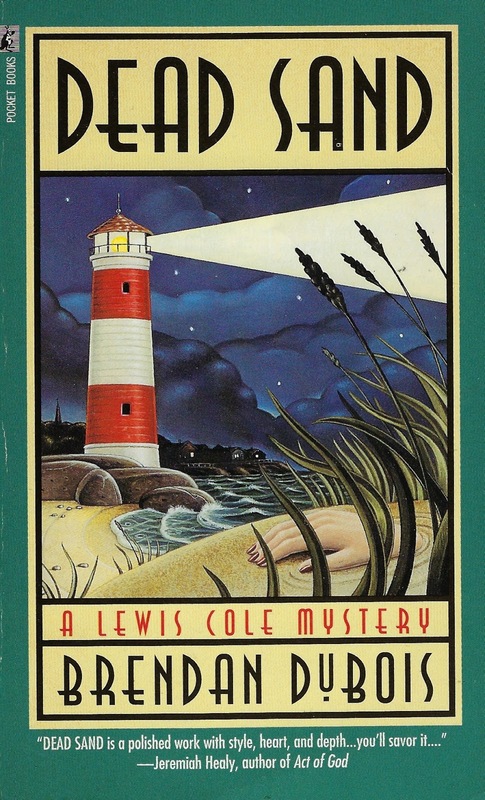 As the first novel in the Lewis Cole series, Dead Sand also features a lot of backstory on the protagonist, and I liked that. Cole's place in the community is unusual; he is a journalist who writes a regular column for a magazine but he also gets involved in helping out the local police on a regular basis. Sometimes that help is welcome, sometimes not. There are two mysteries in this book. Who is Lewis Cole and how did he come to Tyler, New Hampshire? And who is behind a series of local deaths? 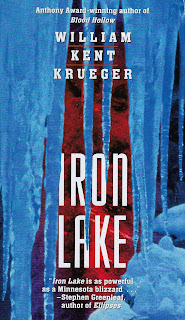 Iron Lake is William Kent Krueger's first novel, starring Cork O'Connor, the former sheriff of Aurora, Minnesota, ousted in a recent recall election. Many residents of the small town still think of him as sheriff and ask him for help when they get into trouble. Cork is also half Irish and half Anishinaabe Indian. The Anishinaabe reservation is near to Aurora, and the town and the reservation share usage of nearby Iron Lake. This story tells us about Cork's connection to the reservation, and his history with his wife and family. Gradually we learn about the political situation in the town and the disputes between the townspeople and the reservation. I like the way the story is slowly revealed. Although we know from the beginning that a death has occurred, we don't know if it is murder or not for quite a while. This book has it all. Complex characters. A meaningful plot. Lots of surprises. Very good pacing. At first I found Cork's wife to be a cipher, I could not connect with her. I don't know that I ever liked her, but in the end she was just as complex as any of the other important characters. Sometimes, I didn't like Cork all that much, but the story explains a lot of his behavior, his background, and I found him admirable in the context of what he had experienced. The family dynamics are very, very good. He has children that he cares about and he wants to be with them; yet he and his wife are separated, so he cannot be a real part of their lives. The children are at different stages of development and I liked his relationship with them and his patience with them. Another bonus is that the book is set at Christmas. It is not a traditional Christmas mystery by any means but Christmas does play a part in the plot. And finally, I enjoyed this book for the setting, which not only included the physical setting of northern Minnesota but also the proximity to an Indian reservation and the juxtaposition of the Indian culture vs the town culture. Cork's mixed race causes issues on both sides. I am very glad I finally ready this book. 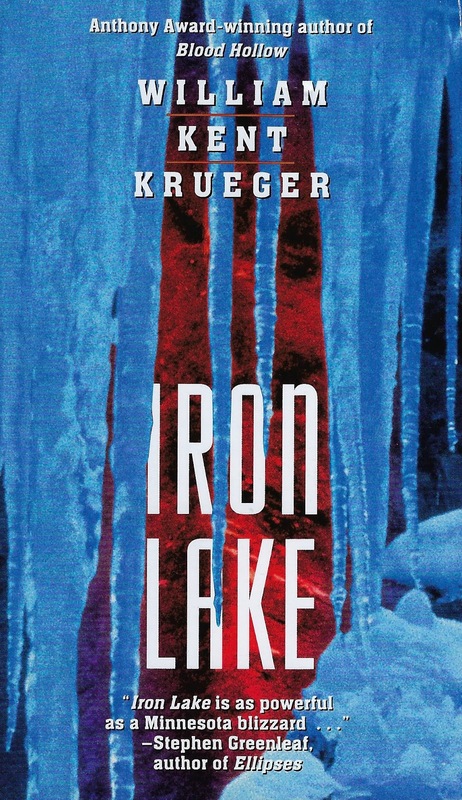 I bought my copy of Iron Lake over 5 years ago and it was first published 20 years ago. I was motivated to move it to the top of my TBR pile by a recent recommendation from Richard at Tip the Wink. His review is here. I want to see how a lot of this plays out for Cork. So I will be reading more of the series. Publisher: Pocket Books, 1999, orig. pub. 1998. The Six Degrees of Separation meme is hosted by Kate at booksaremyfavoriteandbest. The idea behind the meme is to start with a book and use common points between two books to end up with links to six other books, forming a chain. Every month she provides the title of a book as the starting point. 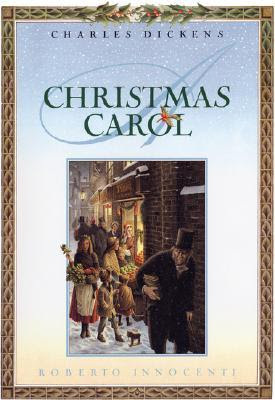 The starting point this month is A Christmas Carol by Charles Dickens, thus this is a perfect first post for December. I am sure I have read this story long ago, but then maybe I am just familiar with film adaptations. (My favorite is Scrooged with Bill Murray.) I do have the illustrated edition pictured here, and I will be reading it this month. For my first link I will make the obvious connection, another book with a Christmas theme. 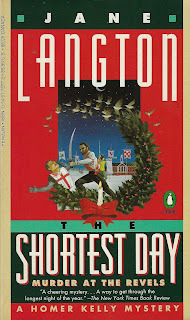 The Shortest Day by Jane Langton is set in Cambridge, Massachusetts, where Homer and Mary Kelly are teaching a class at Harvard University. Mary is participating in the annual Christmas Revels when a young singer in the event dies in an automobile accident. When other deaths follow, Homer resists getting involved, even though he was once a homicide detective. I next link to another book featuring an academic setting ... 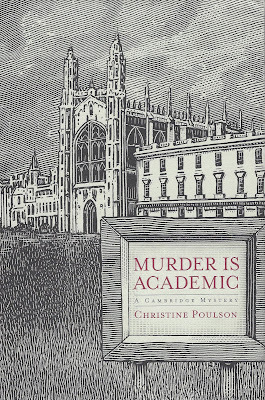 Murder is Academic by Christine Poulson. The UK title is Dead Letters. This is the first book in Poulson's Cassandra James series. Cassandra becomes the Head of the English department at St. Etheldreda's College at the University of Cambridge, after the former Head, a close friend, dies. This is one of my favorite academic mysteries. I move on to another book set at the University of Cambridge, The Cambridge Theorum. The main character, Derek Smailes, is a police detective assigned to investigate the death of an undergraduate. 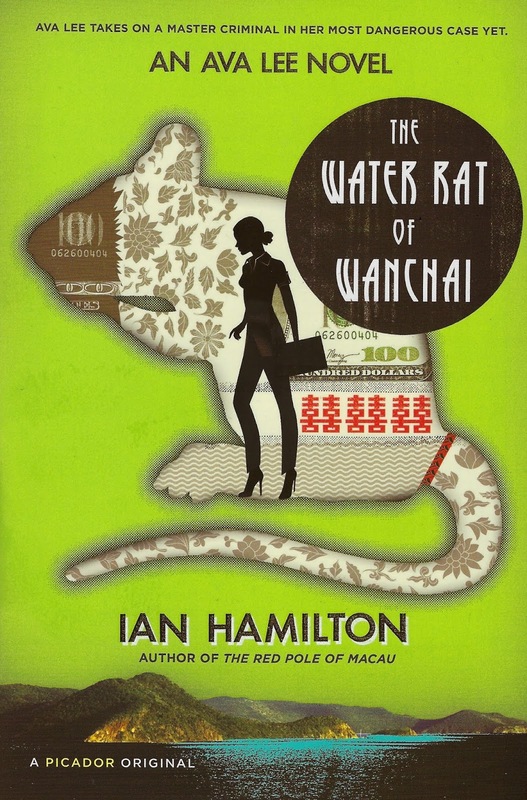 It is a combination of a police procedural and an espionage novel. 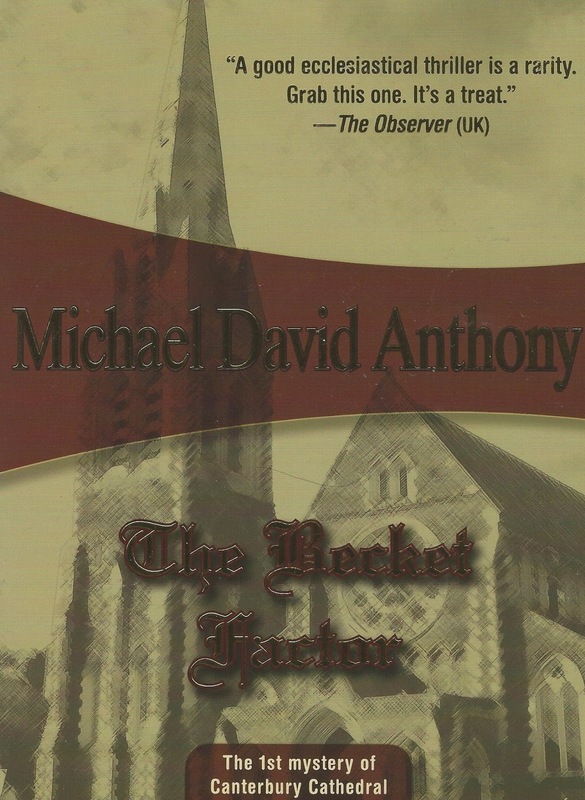 My next choice would be The Becket Factor by Michael David Anthony, which also includes elements of espionage with another subgenre, this time a clerical mystery. Published in 1990, politics, local and national, are also touched on. 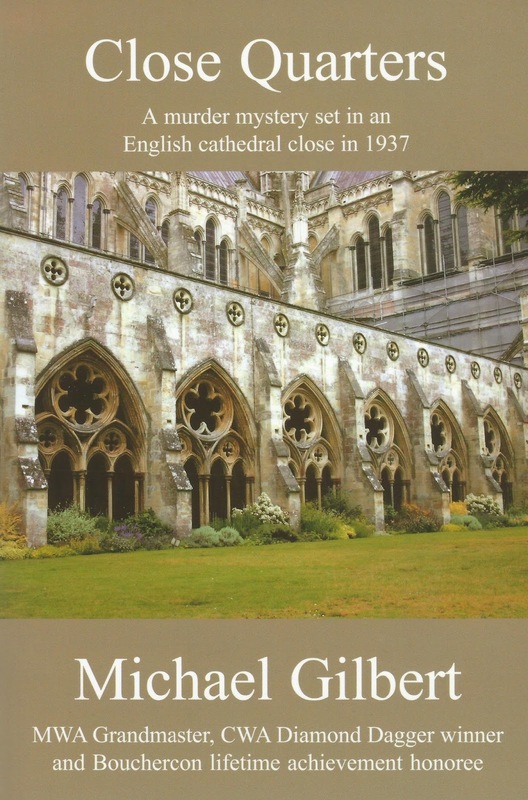 The main setting for this book is a cathedral, Canterbury Cathedral, and its surroundings, which leads me to another book set in a Cathedral close. 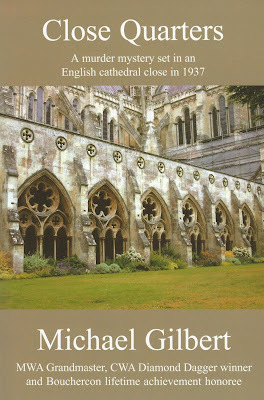 Close Quarters by Michael Gilbert was my first exposure to life in a Cathedral close, which made it doubly interesting. 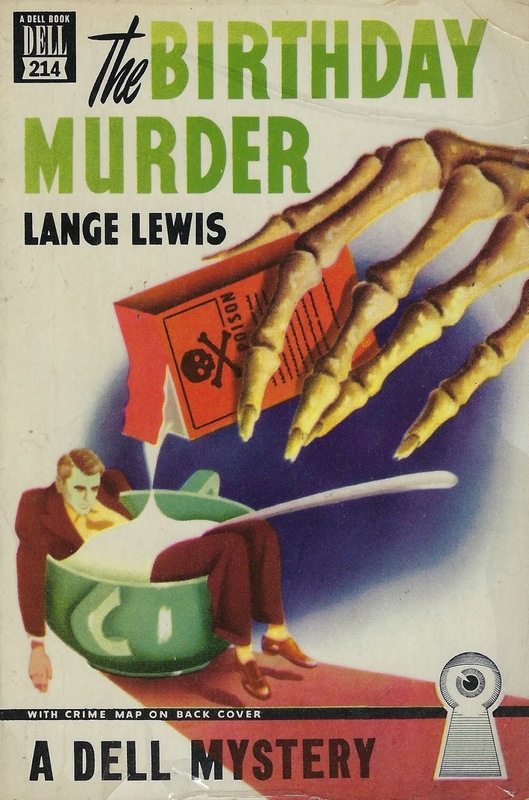 That book was published much earlier, in 1947, and is very much a traditional puzzle-type mystery. 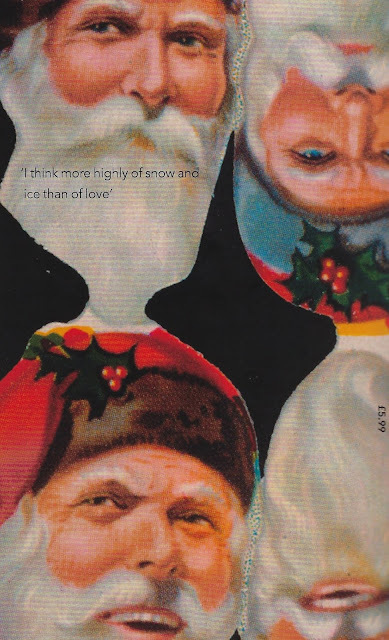 My last book in the chain has even more of a religious emphasis, and takes us back to the Christmas theme. 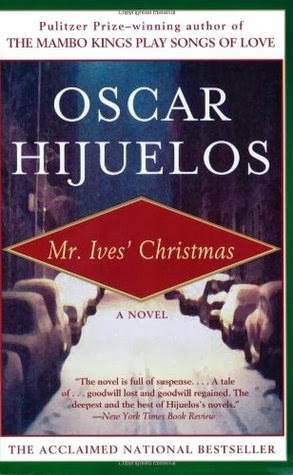 Mr. Ive's Christmas by Oscar Hijuelos is a novel that tells the story of a man's life and the grief he suffers when his son dies in a senseless robbery a few days before Christmas. Mr. Ives' religious beliefs and faith are at the center of this book, but family relationships and friendships are also stressed. My chain this month began and ended with Christmas stories, and in the middle there were books with academic or ecclesiastical settings. I look forward to seeing the direction of other Six Degrees posts. 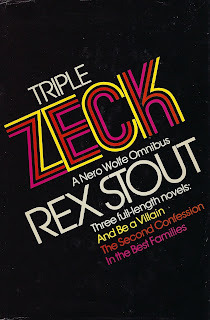 This book, the 13th in the Nero Wolfe series, is the first in a trilogy that features Wolfe's archnemesis, Arnold Zeck. This is a re-read for me, of course. In this story, the characters include a radio talk show host, Madeline Fraser, and her entourage. 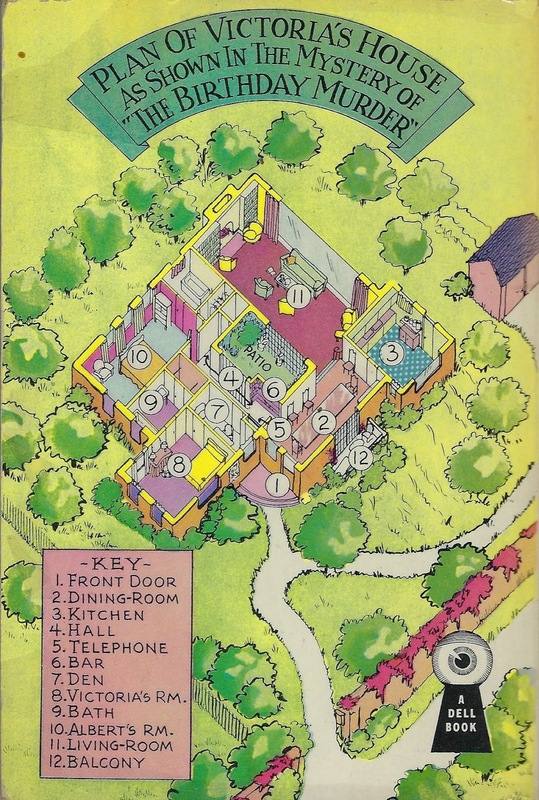 A guest on the show dies from poisoning, and Wolfe investigates. An enjoyable read, as always. Motivated by money alone, Nero involves himself in a crime which has been broadcast over a great national network. A leading lady of the microphone interviews a racetrack tout and a professor of mathematics. In the course of the interview, as a plug for one of the sponsors, a noted soft-drink manufacturer, each guest is served a bottle of the beverage. To the astonishment of the radio public, the embarrassment of the soft-drink manufacturer, and the annoyance of the New York Police Department, the racetrack oracle instantly drops dead of cyanide poisoning. How did cyanide get into the drink? And how could anyone be sure that the tout would receive the fatal bottle? Or, for that matter, was the poisoned bottle intended for him at all? Nero Wolfe's usual approach to detecting is to work only when he needs money. He often charges so much to work on a case that he can pick and choose when he wants to work. Occasionally he will be motivated by friendship or a feeling of responsibility to investigate, but this is one of those times that he has run out of money and wants to persuade the central figures in the case to hire him. In And Be a Villain, he has multiple clients: the radio personality, and the many sponsors of her show, all of whom want this incident far behind them. And this is one case where Wolfe really has to work for his money. There are no easy answers, and the perpetrator is very, very clever. The investigation involves a lot of leg work, which Wolfe never does and is even more than Archie can handle. Wolfe tries (somewhat successfully) to use the police to follow up on clues he has found. 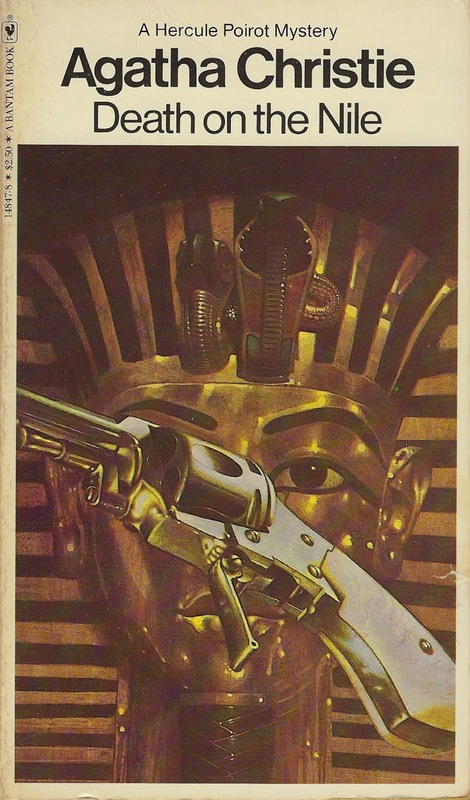 As mentioned above, this book is part of the Arnold Zeck trilogy. 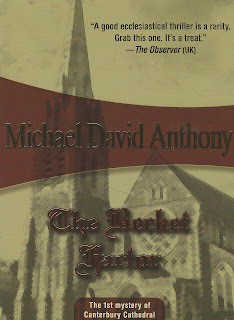 The two other books that feature that villain are The Second Confession (1949) and In the Best Families (1950). In this book, Wolfe only encounters Zeck at the very end, more like a cameo to whet our interest. The next two novels in the series include more involvement with Zeck. 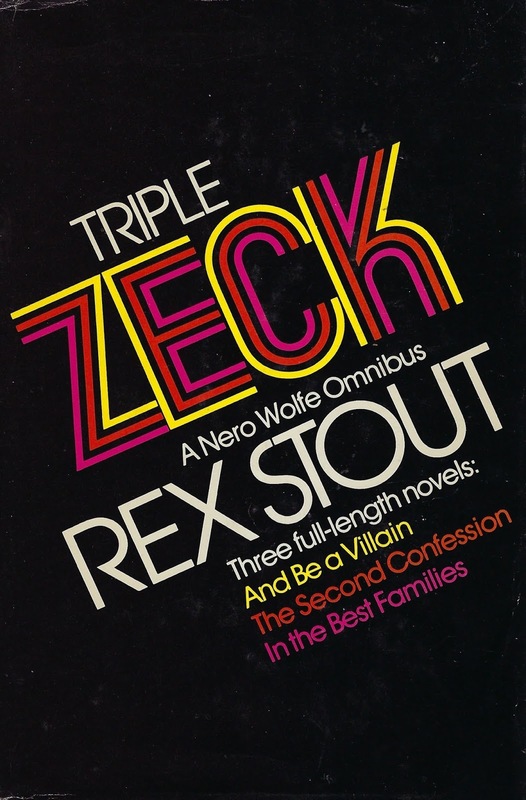 All three were published together in an omnibus, Triple Zeck. Many fans of this series consider these three books to be some of the best in the series. I do like this one a lot. 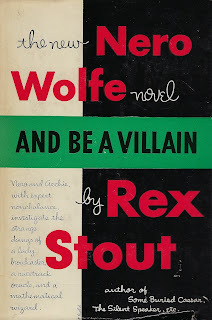 Usually it is Nero Wolfe's "family" (Archie, his legman; Fritz the cook and Theodore, the gardener; and the stable of freelance investigators) that I enjoy reading about. This time, Madeline Fraser and her employees, sponsors, and devoted fans provide the entertainment, until the deaths continue to mount up. Stout often likes to poke fun at big businesses like the marketing and advertising industries, and he gets a lot of opportunities here. In the Book Club Edition I read this time, the beverage in question was called Starlite. In later editions, it was called Hi-Spot and that is the name that I remember. I actually did not notice the difference at all until it was pointed out in a review on Goodreads. That review is very good and has lot of insights, other than the issue of the drink name, but it does get into detail about the story, so keep that in mind if you read it. The two different sources give different reasons for the name changes but either way, it was interesting. Back in 2016, I posted a list of classic books I wanted to read. At the time I was in the mood to have a loose goal, an open-ended personal project to read more "classics." Since then I have read 10 of the books on that list and written about 8 of those. 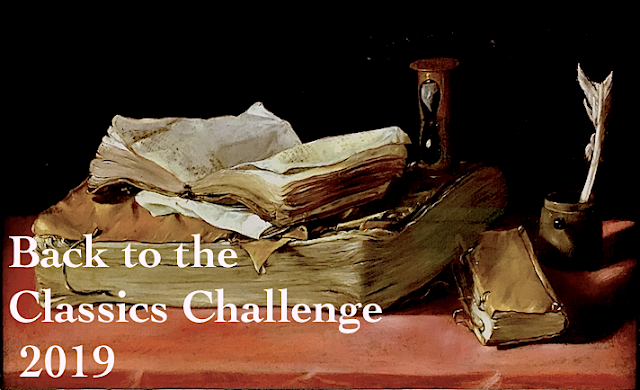 Recently I decided I wanted to revise the list, and make it official by joining The Classics Club, an online group that focuses on reading classics and posting about books read. The main requirements are to create a list of at least 50 classic titles that I plan to read and blog about within the next five years. So here is the new list, now with about 70 titles. Since I am posting this on November 25, 2018, my goal date to have finished all the titles is November 25, 2023. The definition of a classic is pretty much up to the person creating the list. My list is still primarily works of fiction that were published over 50 years ago that have "stood the test of time." I removed some titles, adding more titles. I did add one title that was published in 1972, so not quite 50 years old. Because the number of titles is greater, I also increased the number of classic crime fiction, science fiction, and fantasy books. The club acknowledges that readers may want to change the list around over time, and it is allowable to "switch up the titles on your list after you post it, at any time during the duration of your challenge." Crime in post-communist Russia has only gotten worse: rubles are scarce; blood, plentiful. In the eyes of Inspector Porfiry Rostnikov and his metropolitan police team, newfound democracy has unleashed the desperation that pushes people over the edge, and has emboldened those already on the path to hell. ...A trio of nasty cases confirms their worst fears. The major case involves a Mafia shoot-out at a cafe; several innocent bystanders are killed or injured, and one of the dead is someone important to Inspector Emil Karpo. An American FBI agent, a Black man who can speak Russian, is assigned to the team to observe and help with this case. The second assignment involves three young boys who are robbing and beating people in their neighborhood, and another member of the team works on the disappearance of valuable artifacts. Inspector Rostnikov is the center of each novel. He has a leg injury suffered during military service, which causes him pain and inconvenience in his job. He reads Ed McBain novels. His wife is Jewish, which has also caused problems with his job. His grown son is fighting in Afghanistan when the series begins. There are several police colleagues on Rostnikov's team who have recurring roles. Their relationships play a part in each novel. Inspector Emil Karpo, known as "the Vampire," is cold and forbidding, almost robotic in his behavior. He has always supported Communism and still does, even after the change in government in Russia after the breakdown of the Soviet Union. As the series progresses, he becomes more human and thus a more interesting character. This series is intriguing because of the picture of life in Russia during this interesting period. Rostnikov's strongest characteristic is his support of his staff in the face of the continuing changes in Russia and his ability to get the best out of them. He recognizes their differences and their gifts. For me, the criminal plots are less important than the interactions of all the characters, yet each subplot is interesting, if sometimes depressing. This series is best read in order; the characters grow and their lives change from book to book. Stuart M. Kaminsky (September 29, 1934 – October 9, 2009) was an American mystery writer and film professor. He was a very prolific writer, and he is known for four long-running series of mystery novels. Two of the series feature police detectives, the Inspector Rostnikov series and the Abe Lieberman series. The other two series are about private detectives; the Toby Peters series is set in 1940's Hollywood and the Lew Fonescu series is set in Florida. 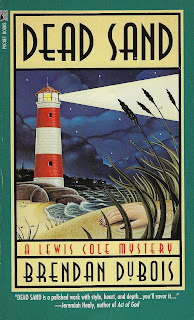 The Toby Peters series is the longest and those mysteries are humorous; the other series are more serious in tone, sometimes dark. 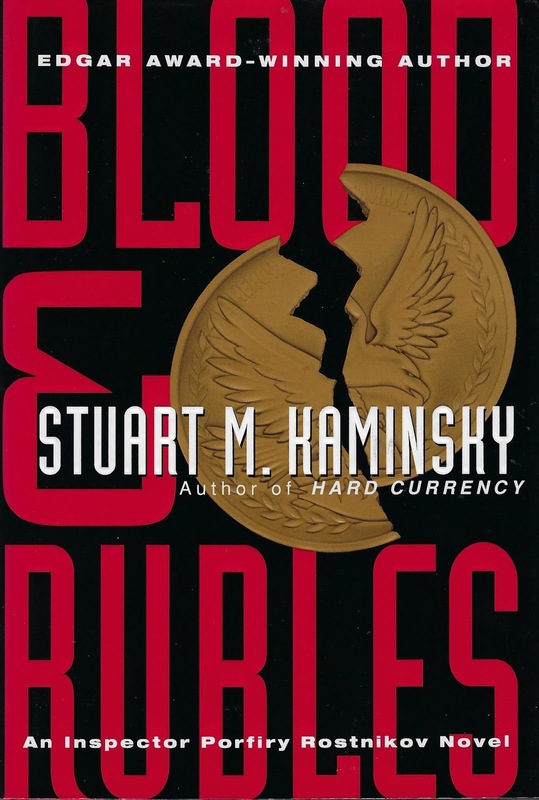 Kaminsky received the 1989 Edgar Award for Best Novel for A Cold Red Sunrise, the fifth novel in the Inspector Rostnikov series. 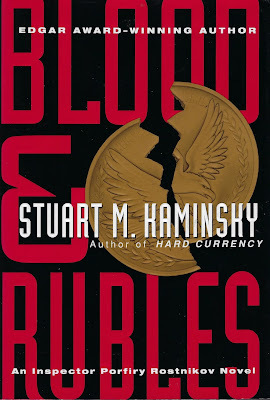 Many of Stuart Kaminsky's books are available through MysteriousPress.com/Open Road in e-book format or in trade paperback. 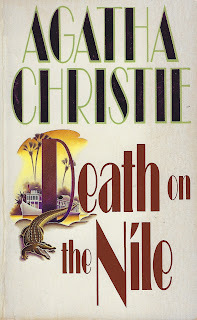 Death on the Nile is the 15th novel in the Hercule Poirot series. I have been reading the books -- within each series -- in order when possible, but this time I skipped ahead three books to this one so I could watch the movie version (from 1978). The first section of the book (very brief) sets up the story, introducing the varied group of people who will end up taking a cruise on the Nile. I enjoyed the last Poirot book that I read, Death in the Clouds, but I liked this one even more. It was a good bit darker. 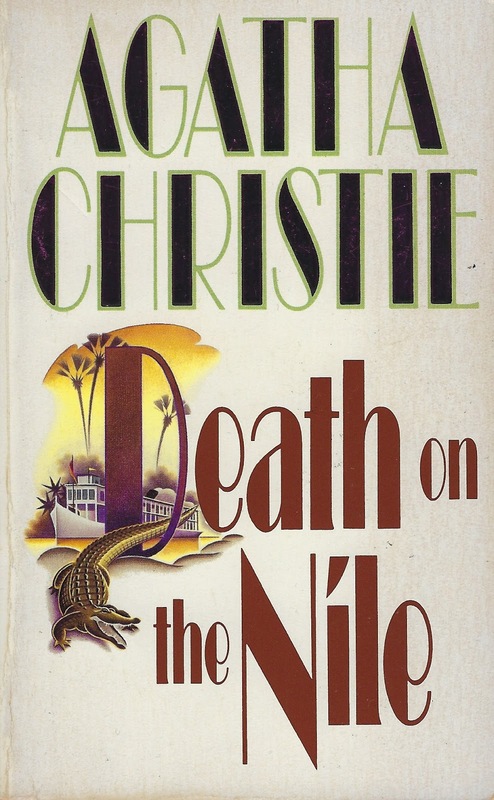 The death occurs on the cruise in an enclosed environment, and Hercule Poirot, along with his old friend Colonel Race, must solve the mystery. I have a fondness for Colonel Race (in The Man in the Brown Suit, which also involves a luxury cruise) and I liked that he has a significant role here. In Death in the Clouds, Poirot talks about the psychology of crime and that is also a big element here. There was a large cast of interesting characters, thus lots of suspects. I did figure out who did it way in advance but still Christie kept me wondering ... all the way through the book. I love the way she does that. There were many mysteries beyond just the normal whodunit. A lot of the relationships and the reasons for people taking the trip were questionable and had me wondering. A perfect mystery in that respect. I think the Poirot books are just getting better and better. 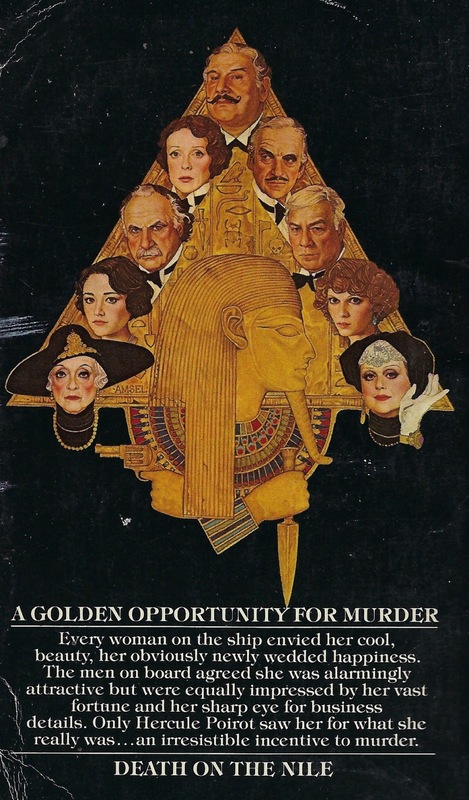 I look forward to getting back to the three I skipped: Murder in Mesopotamia (1936); Cards on the Table (1936); and Dumb Witness (1937), aka Poirot Loses a Client. But sometime soon I will also move ahead to Evil Under the Sun, because I want to watch the movie based on that book. I watched the 1978 film with Peter Ustinov as Poirot. I think he is a fine Poirot. The back cover (above) shows the most prominent stars in the cast, which include: Maggie Smith, Angela Lansbury, Bette Davis, Mia Farrow, Olivia Hussey, David Niven, George Kennedy and Jack Warden. Some of the main roles are played by actors I was less familiar with but they were good in their roles: Lois Chiles as Linnet and Simon MacCorkindale as Simon, her husband. I preferred the book over the movie because of the depth of the characterizations and the details of relationships in the book, even though Christie did keep some of the motivations vague in order to heighten the suspense. In the movie, some of the minor characters changed or disappeared from the story entirely. But the movie was very entertaining and I liked all the actors and how they portrayed the characters. See reviews at A Crime is Afoot (with lots of links to other reviews), Classics Mysteries, Vintage Pop Fictions, and Clothes in Books. In February of this year I read two novels set in Poland: The Polish Officer by Alan Furst, published in 1995, and Lumen by Ben Pastor, published in 1999. Both covered roughly the same time period, 1939 - 1941. As you can see from that description, a lot of the book takes place in other countries, and especially in France. I was surprised by this book. It was drier than the first two books in the Night Soldiers series, and it felt more like a history than fiction. I liked the story but the characters did not grab me, not even the main character. Furst is very strong on research and the story feels very authentic. 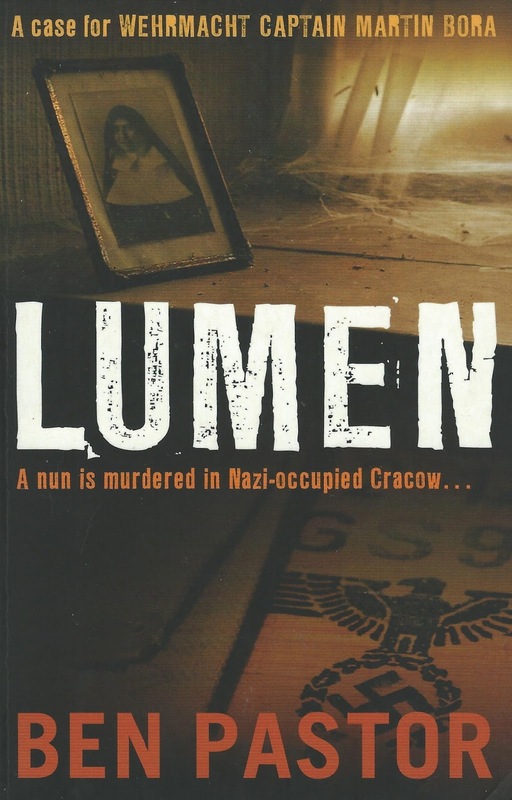 Immediately after reading The Polish Officer, I started reading Lumen. The books were a perfect pair. 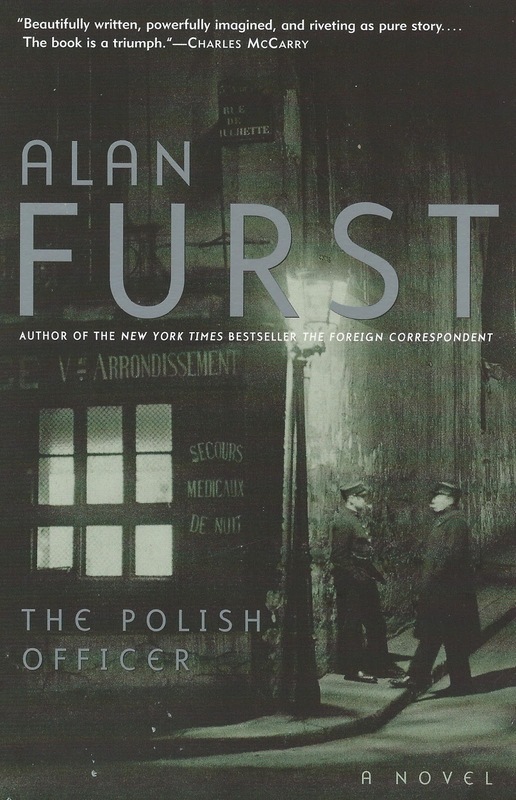 I learned a lot about Poland during the time period from Alan Furst's book, and that knowledge made this an easier and more interesting read. The protagonist of Ben Pastor's novel is a Wehrmacht captain in Intelligence, Martin Bora, stationed in Cracow during the Nazi occupation of Poland. He is tasked with investigating the death of a nun. Father Malecki is in Cracow to investigate Mother Kazimierza's prophetic powers. He is ordered to stay and assist in the inquiry into her killing. Thus the two men must work together. The story is about solving the mystery of her death, but also is about much more, including the treatment of the citizens of Poland during the occupation. Reading a book set during World War II with a German officer as the protagonist is challenging. Bora has doubts about some of the atrocities carried out by other groups of soldiers, but he is committed to the Nazi cause. At times the story seems fragmented because of the focus moving from murder investigation to war time activities, but that is realistic. I was more interested in the picture of the times, seeing the activities from a different point of view, than I was in the mystery plot. I will definitely take the opportunity to read the second book in this series, should I find a copy. I found it very good reading and I always like to read about the events of World War II. But this book stands alone pretty well. At A Crime is Afoot, two posts talk about The Polish Officer and an overview of the Night Soldier series. At Goodreads, John Grant's review of Lumen. Lumen reviewed at the Historical Society Website.